Homemade "Reece's" cups, but with only 5 ingredients! Zero refined sugars, dairy or gluten make these sweet treats totally guilt-free. Enjoy! 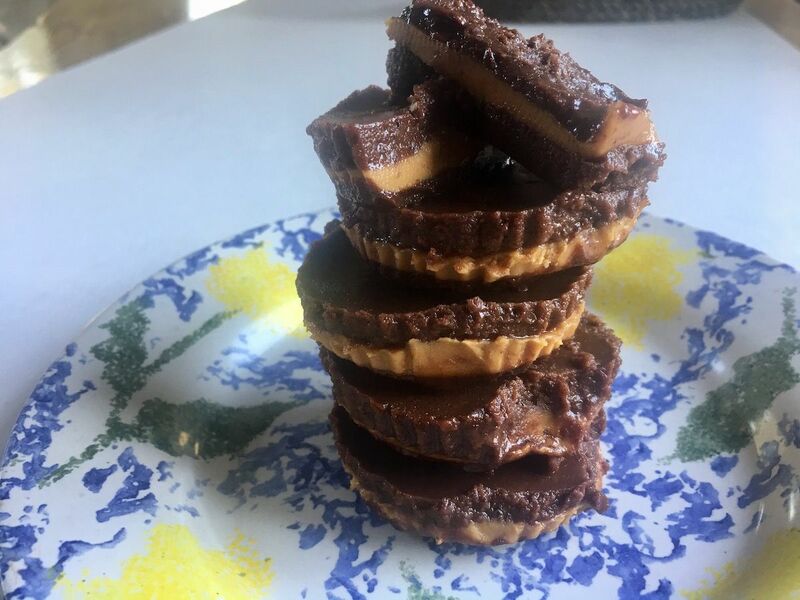 Switch Reese’s Cups for these homemade almond butter cups. Both vegan and paleo friendly, and made with just 5 ingredients (rather than 18). 1) Melt the coconut oil for the chocolate layer and place in a large mixing bowl. 2) Add cacao powder, honey or maple syrup and vanilla essence and mix well. 3) Place 8 cake liners in a baking pan (preferably one with build in wells so the cups keep their shape). 4) Put roughly 2 tablespoons of chocolate mixture in the bottom of each case. 6) Meanwhile, melt almond butter and coconut oil together until smooth and liquid. 6) Retrieve the hardened cups and add 2 heaped tablespoons on top of the hardened chocolate bottom layer. 7) Freeze again for 15-20 minutes. 7) Using the remaining chocolate mixture, fill up the cake case-covering the nut butter completely. 8) Place back in the freezer until hard (approximately 30 minutes). 9) Peel off the cake cases and enjoy! PS … Store your chocolate treats in the fridge to keep them hard and delicious.